By NICK PISA in The Daily Mail. 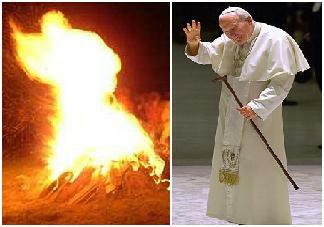 This fiery figure is being hailed as Pope John Paul II making an appearance beyond the grave. The image, said by believers to show the Holy Father with his right hand raised in blessing, was spotted during a ceremony in Poland to mark the second anniversary of his death. Details appeared on the Vatican News Service, a TV station in Rome which specialises in religious news broadcasts. McCartney or a miracle? Pope or pop? Others have suggested the likeness of Elvis and Jimmy Connors. Still, the thought of the pope in flames? Makes one wonder just where he’s spending eternity. This entry was posted on October 25, 2007 at 11:02 am	and is filed under Generic. You can follow any responses to this entry through the RSS 2.0 feed. You can leave a response, or trackback from your own site.